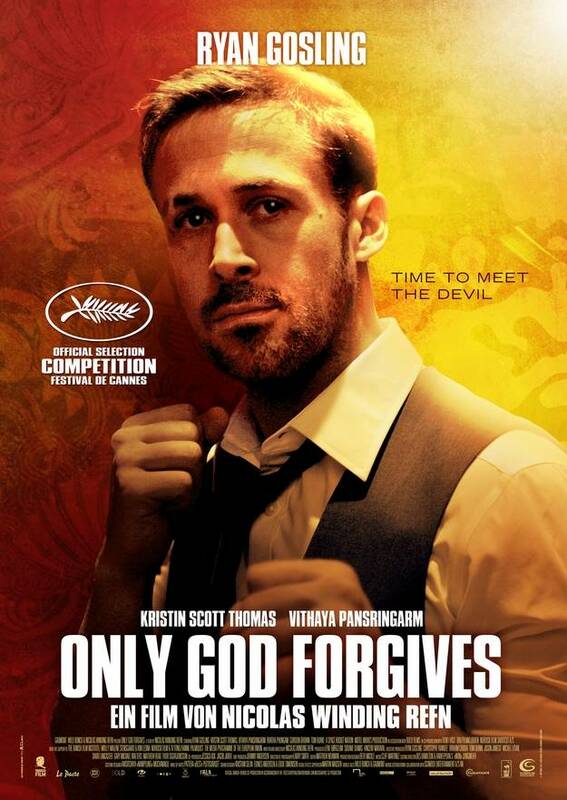 Only God Forgives opens this week in Seattle as well as via home streaming options. Seeing a repeat pairing of Ryan Gosling and Nicolas Winding Refn one might be expecting a visually stunning film like Drive or a solid straight thriller like the Pusher trilogy. But banish that frame of reference from your thinking - 'cuz that's not what's coming. Instead they've created something more akin to a thriller through the eyes of Jarmusch with a healthy helping of David Lynch homage on the side. Meaning it's slow, indirect, obscure, surreal and with a lot of red tones. Both from the copious blood and the Thai decor. Together it's an interesting fusion of mythological underworld imagery crossed with something from Twin Peaks, where you expect a dancing little person to emerge into each scene. Also have to say it's a clear winner of film most likely not to have have been sponsored by the Bangkok visitors bureau nor their local organization for fair and just policing practices. 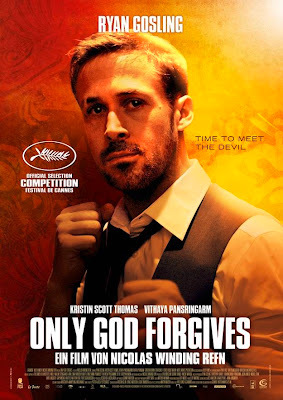 Bottom line Only God Forgives feels more like a master class on visual symbology than what I wanted to watch on a Friday night. Ryan Gosling is a man assigned to avenge the death of his brother. While reluctantly pursuing his killer an avenging angel (or devil) of a cop appears hot on his trail. Shot in a dreamlike stupor it's never 100% clear which of the brutal and graphic violence is real, a psychological detour, a metaphor for heaven and hell or just weirdness for the sake of weirdness. It's also not transparent for much of the film what specific exploitative business Gosling is in, but given the circumstances of his brother's death he's understandably of mixed mind of how hard to push the revenge thing. Egged on by his lifetime of therapy inducing mother he begins an investigation. One that takes him and his family deep inside the belly of the beast. Leading to less than subtle Shakespearean tragedy (or maybe justice) as scene upon scene of blood being washed off hands is foisted on us. Yep, idle hands are clearly the devil's workshop. Or something similar. At least based on the more than ten scenes in which characters none too subtlety look at or brandish their hands. Not to mention the negative impact on some of these appendages amongst the naughty. What's real, and what's not is a constant question from the moment Gosling's brother departs with the phrase "off to meet the devil." Refn goes for slow, languid but lush cinematography and minimal dialog in place of more traditional thriller action. The scenes of violence are sparse, trimmed down to their bloody essence. Fans of gore will get something but may not be as thrilled for the wait he puts them through. Gosling followers will recognize the man of few words and likely be impressed with his ability to emote weakness and pain in between blank stares. Kristin Scott Thomas has an incredible role, but I'm still not convinced the over the top choices on how to play it were the best ones. Positive high points of the film exist. Most notably the elegantly shot anti-climactic fight with the stalking policeman in an abandoned gym. As well Gosling's moments of definitive action when pushed to a line he can't cross. But the getting there was rather thoroughly uninteresting for me. Much the same as in a Lynch film that's gone too far or recent Jim Jarmusch, the journey didn't interest me enough to make up for the mystery. Long slow shots that make you pause and think, and think, and think while waiting for someone to say something ... anything can sometimes be cinematic perfection for me. In this case it wasn't. Maybe a noble bloody experiment. But not one that sucked me in. And yeah, I get it could be a big statement on negative influences of foreigners corrupting Thai society. But I just wasn't into it, sorry to say. One seriously notable exception is the performance of Vithaya Pansringarm who delivers a compelling portrait as the mystical police officer Chang. Yes, mystical - it's that sort of trippy trip. Some people will absolutely love this film. And intellectually I can see why even though I couldn't connect with it. But for me all the symbolism and brooding pacing never got me hooked enough to really care to figure out all the intents behind the scenes. Obviously Refn knows shot to shoot compelling action and mesmerizing visuals of Thailand after dark. But that wasn't enough for me to recommend the film. Your mileage may certainly vary. In good news for fans of not going to the theater and Anna Kendrick Only God Forgives is available for home viewing as well as in theaters. So you can pause and extend your Ryan Gosling fix as needed. Not that you have to, his shots are so long at one point I thought I'd paused the film only to realize it had been technically moving forward for at least 15 seconds. Just click this link and Amazon will be happy to hook you up with a two day rental.